San Diego-born beverage catering and mixology experts Snake Oil Cocktail Company will be the exclusive food and beverage management partner for The Conrad Prebys Performing Arts Center, a progressive music hall and private event space opening this spring in La Jolla. The Conrad, as it is more informally called, is a 49,000 square foot, $78.5 million, state-of-the-art event facility that has been conceived and designed from the ground up. Located in the heart of The Village of La Jolla, the property is comprised of a 513 seat concert hall, a contemporary performance space, a central courtyard and entertaining area, as well as an elegant open air terrace. In addition to concert performances from A-list musical artists and classical performers, the space will host medium to large scale corporate events, galas and exclusive weddings. Working in partnership with the La Jolla Music Society, Snake Oil Cocktail Company will bring their event experience and cocktail prowess to this world-class music hall and event space. “The Conrad represents a historic cultural achievement for San Diego and the vision for the space is nothing short of world-class," said Snake Oil Co-Founder and Managing Partner Michael Esposito. 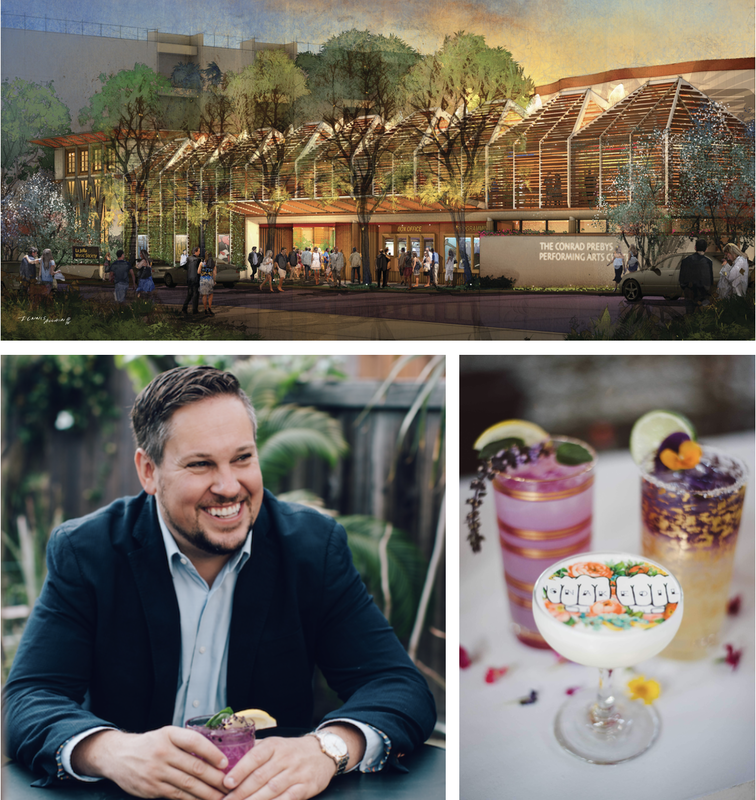 "The La Jolla Music Society has been an incredible partner and we are excited to bring cutting-edge cocktails and an elevated concession experience to such an extraordinary space." During concerts in The Conrad's Baker-Baum Concert Hall, guests will be able to take advantage of the concession service, open before and during performances. In addition to thematic craft cocktails and unique beverage experiences, the beverage offerings will include wine and champagne by the bottle, local craft beers, a curated list of fine spirits, and gourmet snacks, highlighting some of San Diego’s best artisans and confectionaires. There will also be an outdoor gathering space bordered by beautiful mature olive trees called the Wu Tsai QRT.yrd and Belanich Terrace, which will be located between the performance halls. Boasting an expansive 4,000 square feet, the courtyard will be a beautifully manicured outdoor area where guests can enjoy a craft cocktail or quick bite before or during a performance. On warm summer nights, Snake Oil will offer frozen cocktail options and introduce its latest cocktail innovation, Cocktail Graffiti, for select special events. Founded in 2010, Snake Oil Cocktail Company is one of Southern California’s preeminent beverage catering companies and cocktail consulting firms. Snake Oil specializes in creating immersive full-service beverage experiences for select bars, special events and award-winning restaurants nationwide. Clients have included the The San Diego Symphony, The Hard Rock Hotel, San Diego Polo, New York Yankees, The Sundance Film Festival, The Lyceum Theatre, Aston Martin, Rolls Royce, Tiffany & Co., National Geographic, Warner Bros., Google, and The TED Conference. The Conrad Prebys Performing Arts Center is expected to unveil at 7600 Fay Avenue in La Jolla as early as this April. For more information on The Conrad, visit theconrad.org, and learn more about Snake Oil Cocktail Company at snakeoilcocktail.com.